The Football Front: Does Robin van Persie owe it to Arsenal to sign a new contract? Does Robin van Persie owe it to Arsenal to sign a new contract? 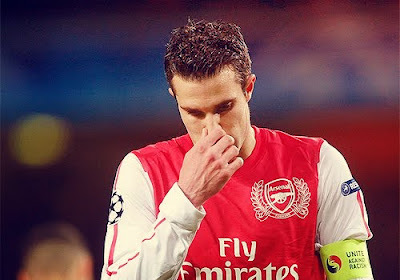 Jordan Florit evaluates whether Robin Van Persie owes it to Arsenal to pledge his future to the north London club. His scoring form has been nothing short of sensational, banging in 25 Premier League goals in 27 appearances; his ability to assist too, playing as part of an attacking triumvirate based on fluidity, raw pace and direct running, has seen him have more involvement with goals than any other player in the Premier League this campaign; and, above all, he’s remained fit all season and has thus played at least 80 minutes in every single Premier League game this season bar one – and then, with 25 minutes left, he was brought on to take a game heading for a 1-1 draw with Stoke, to a 3-1 victory netting twice. It is his richest vein of form since joining Arsenal in 2004 and he has already beaten his previous season’s best return of 22 goals by ten. In the past twelve months, van Persie has been quite frankly unstoppable in front of goal. Firstly, he kicked off 2011, continuing to do so all the way to the end of the season, by breaking the record for the number of consecutive games in which a player has scored a goal away from home, by collecting one on the road for nine successive games. He then carried his exploits in front of goal into the next Premier League campaign and by the New Year, RVP had joined an elite group of players that had scored over 100 career goals for The Gunners – he currently stands as their seventh highest goal scorer of all time – before becoming the fifth player since the Premier League was formed in 1992 to score at least 30 goals in a calendar year. Yet this isn’t a player who is simply a late bloomer, hitting his finest form at the age of 28. Year upon year, since occupying the role as the main striker having seen Thierry Henry depart for Barcelona, van Persie has improved his potency up front. At the end of the 2007/08 season, the first without Henry, van Persie had a goal to game ratio of 0.39 goals per game (gpg). During the current season, the Dutchman’s ratio has increased to 0.86 gpg. Not only has his potency more than doubled at an increase of 120.51% over the five seasons, but it has increased year upon year at an average of 22.55%. This is a man who has constantly been improving, but doing so in the face of extreme adversity. The extreme adversity? Injury. Just how extreme? So extreme that since joining Arsenal he has only been able to start 58% of their games. This is a man who has been held back by injury, but not stopped by it. Many say that Arsenal are a one man team and looking at the statistics – he’s scored 45% of their goals this season, the highest percentage of team goals scored by any single player in the Premier League – they have a case. Furthermore, the aforementioned example of van Persie’s only non-start still requiring him to come off the bench to win the game for The Gunners only strengthens their claim. However, this season is Robin van Persie’s first at Arsenal without any significant absence enforced through injury since the 2008/09 season and even that was an anomaly, with the Dutchman missing large chunks of seasons at a time dating back to 2005/06. Gunners fans have always known the quality they had in Robin van Persie – the past 12 months has been his uninterrupted time to show it to the world. He ceased the opportunity, and the superlatives, as well as the speculation, followed. His contract is up at the end of next season, having signed an extension back in July 2009 at which point, he was described as “a big part of Arsenal’s future” and Arsene Wenger himself stated that he “has the potential to become a true Arsenal great.” Undoubtedly, both statements have been realised: he stands, three years later, as their most important player and provider of goals and has cemented himself in the top ten Arsenal goal-scorers of all-time. He may well have earned the title of “a true Arsenal great,” but can he do more to secure legendary status at The Emirates? Three years have nearly passed and the club he adores so much hasn’t had quite the “bright future” van Persie stated that he wanted to “be a part of.” You could forgive him for wanting to move on now. He’s in his peak flow, he’s 28 and the clubs that consistently find themselves among the silverware are sniffing about like grotty pensioners on a morning bus in January. 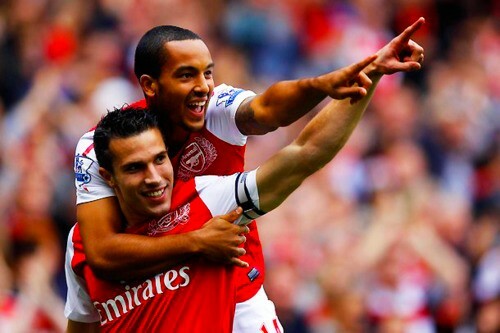 However, does van Persie owe it to Arsenal to sign a further contract extension? Over his Arsenal career, the striker has started in just 58% of Premier League games because of injury and since he joined The Gunners from Dutch side Feyenoord, Arsenal have won just one trophy – The F.A. Cup in the forward’s first season. Imagine if Robin van Persie hadn’t endured such an injury plagued career at the club? How much more success could’ve Arsenal achieved? Lukas Podolski will join Arsenal in the summer at which point his new strike partner will have just one year left on his contract. If he stalls his decision over signing an extension and a club come in for him, he could leave for nothing. If he signs prematurely and another wave of Arsenal transfers fails to deliver, silverware may continue to elude him as he approaches his 30th birthday next summer. Does Robin van Persie owe it to Arsenal to sign a new contract or will much the same happen with Podolski taking the van Persie role and the Dutchman leaving akin to Henry? The only difference is, the Frenchman left with a vast trophy collection – how much does van Persie want the same?